It all started a few years ago when I read The Ultimate Commonplace System, a book by Ludvig Sunström. That was the first time I’ve heard of the word Commonplace. Turns out throughout history many famous people kept a Commonplace book. A book for their ideas, projects and experiments. Now Ludvig was bringing that knowledge to the digital world of the 21st century. I learned about the theory and the benefits of having this type of system. As me being a programmer, this modern commonplace had to be created in some application. There are a few solid options on the market today but none of them are designed to be a complete productivity system. Most of them are just representations of simple notebooks on our screens. Some of them offer synchronizations and others do not and that’s about it. Long story short I tried all of them and didn’t like most of them. Being the naive engineer I decided to build one myself. Shouldn’t be too hard I thought. Well, this has led me through a journey of reading tens of books on productivity, user experience, system design and self improvement. Experimenting with around 20 different systems and applications (and stealing the best ideas from all of them). 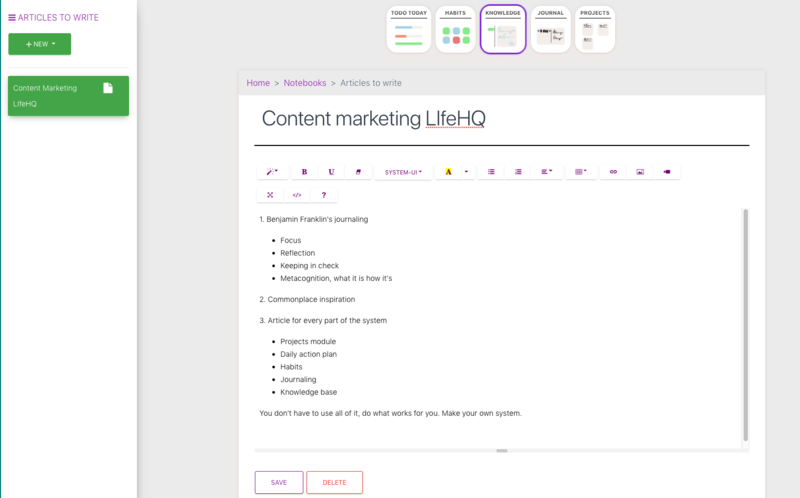 After 2 years and a few unsuccessful prototypes that even I didn’t want to use, LifeHQ is weeks away from launching. During my ultimate productivity quest I discovered 4 functionalities that any productivity system worth its salt absolutely must provide. These 4 areas are tackled in LifeHQ with the 5 modules that follow. Project is everything that requires more than one step to get done. Projects can and should have deadlines. Projects can have many resources: results of research, brainstorming, inspirational ideas, plans etc.. 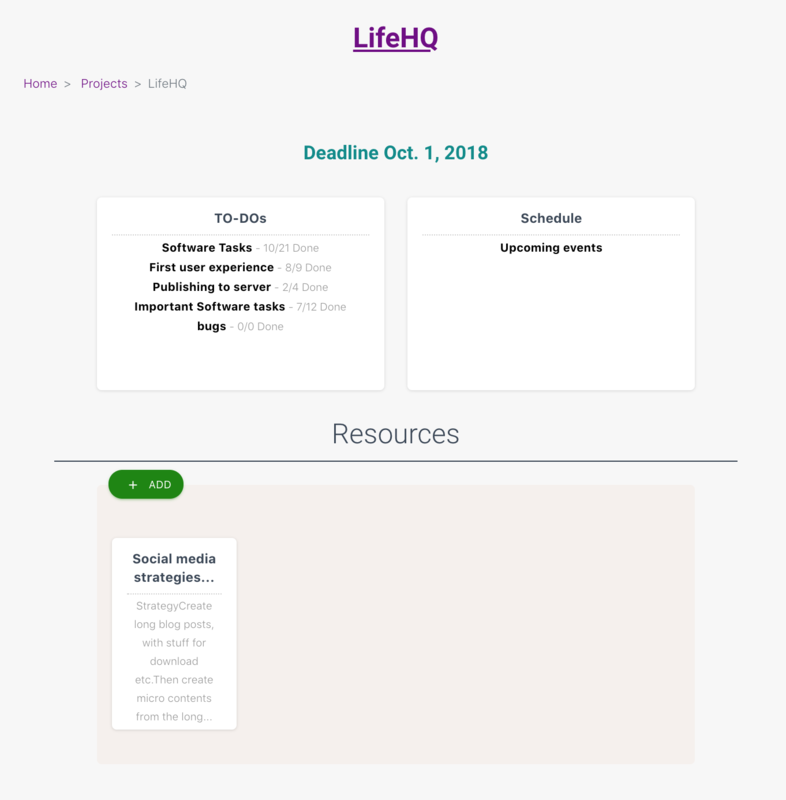 The LifeHQ Projects module provides these 3 functionalities for managing your projects: Lists of tasks (Todo lists), Schedule (Calendar) and Resources module. We all have multiple projects running at the same time. 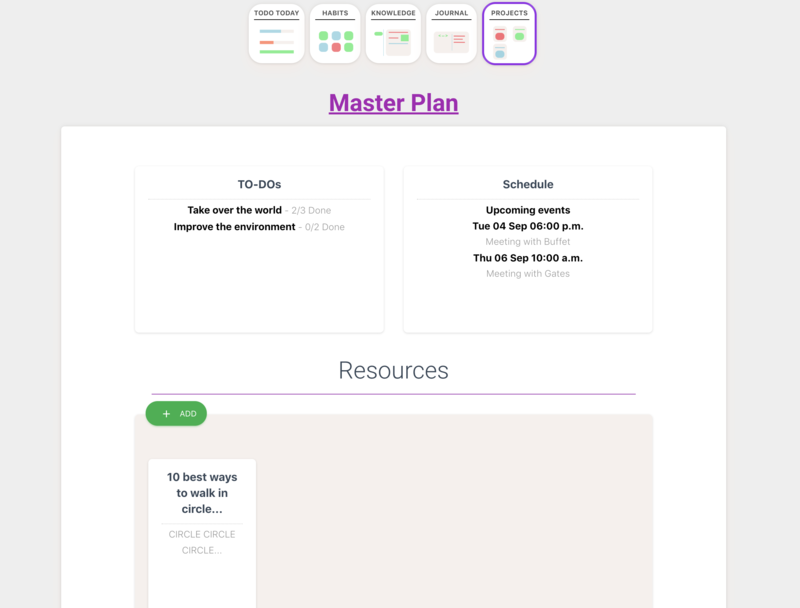 The LifeHQ Daily action plan was designed to help you organize and prioritize your daily tasks. 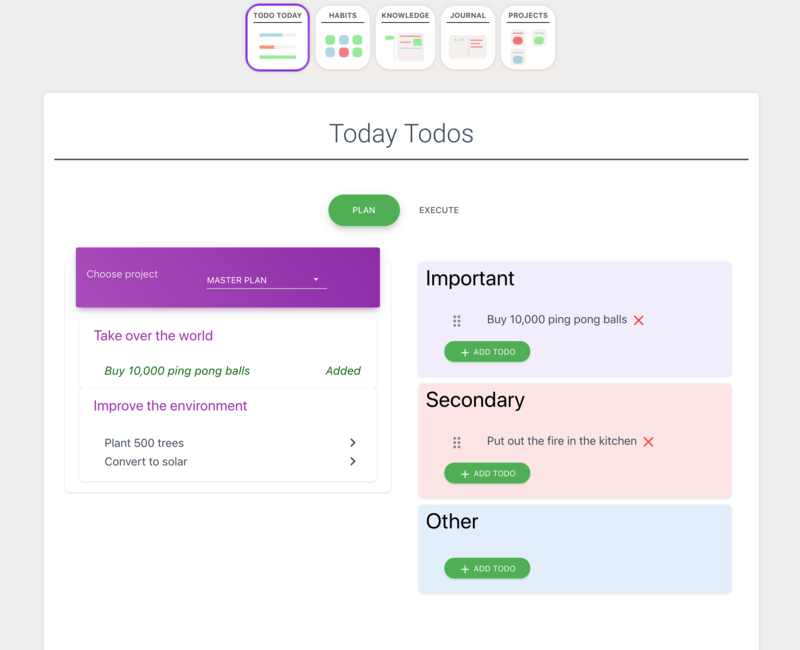 Every evening you go through your projects and choose which tasks to add to your Daily todo lists for the following day. My suggestion is to have no more than 3 Important and 3 Urgent things. However you can not always plan for the Urgent ones. Habits are the things we do with ease, by going with the grain, by automation and that’s why they are so difficult to change. But not anymore. 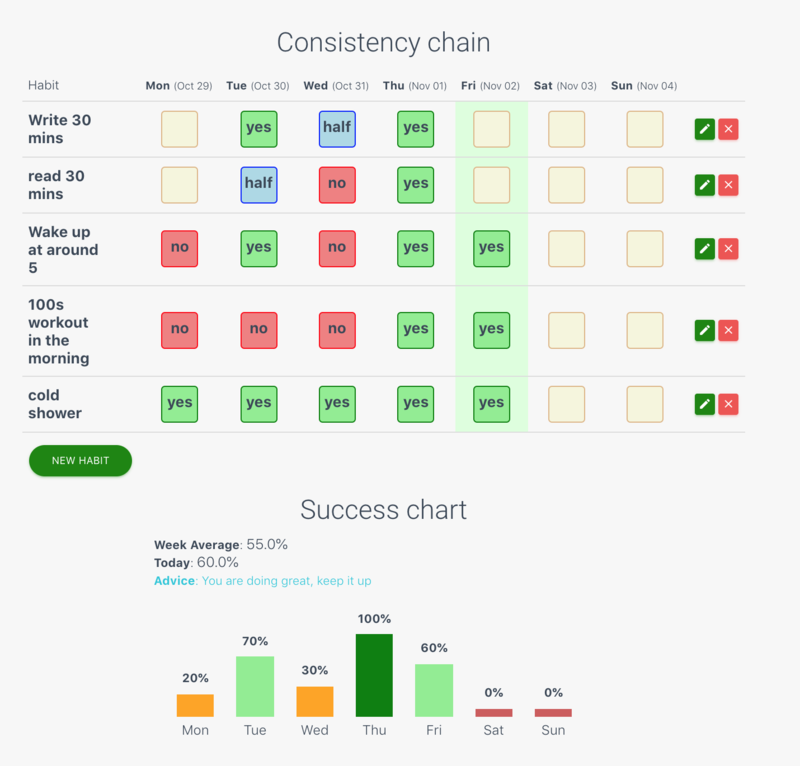 The LifeHQ Habits module will help you acquire and get consistent with new positive habits and eliminate old ones. Success Chart – Bar chart that represents your daily success rate among all habits. Quick tip: The goal is to maintain around 70% success rate. Once you get close to 100% it is time to introduce new habits. If you are bellow 50% you have too much on your plate, remove some habits for later. Napoleon Bonaparte, Leonardo Da Vinci and Benjamin Franklin all kept detailed journals. The most avid of them was Benjamin Franklin who didn’t use the journal as merely a recording device, but as a tool to better himself. The journal was an indispensable tool in his self improvement arsenal. He used it as a way to reflect on all his activities and moral values at the end of the day. His daily journal always began with: What good shall I do today? and ended with: What good did I do today? 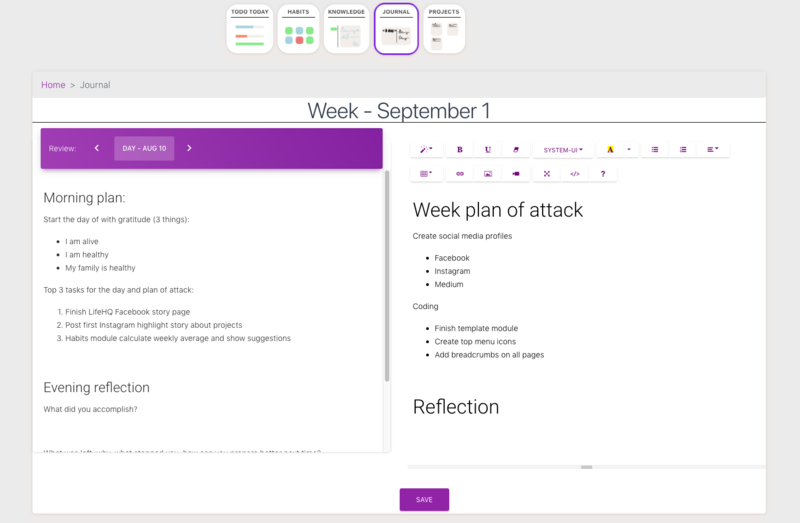 Self reflection is the main reason for creating the Journal module. 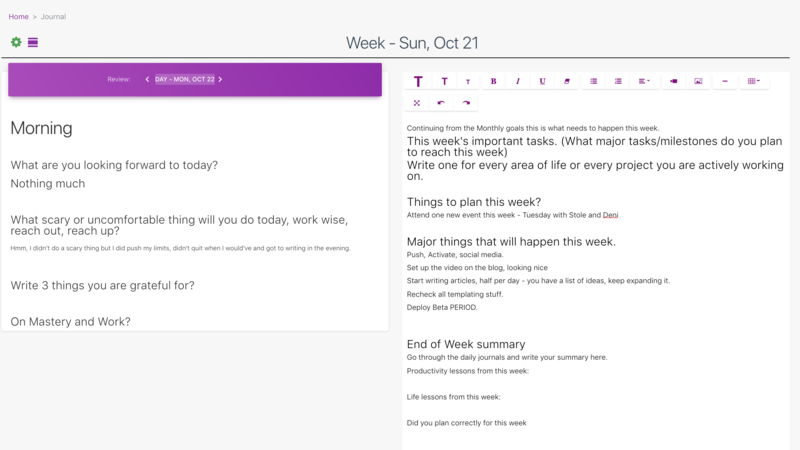 You have the ability to view the journal in writing mode on full screen and reflect mode where you can read the daily entries from the week and write your reflection in the week entry. 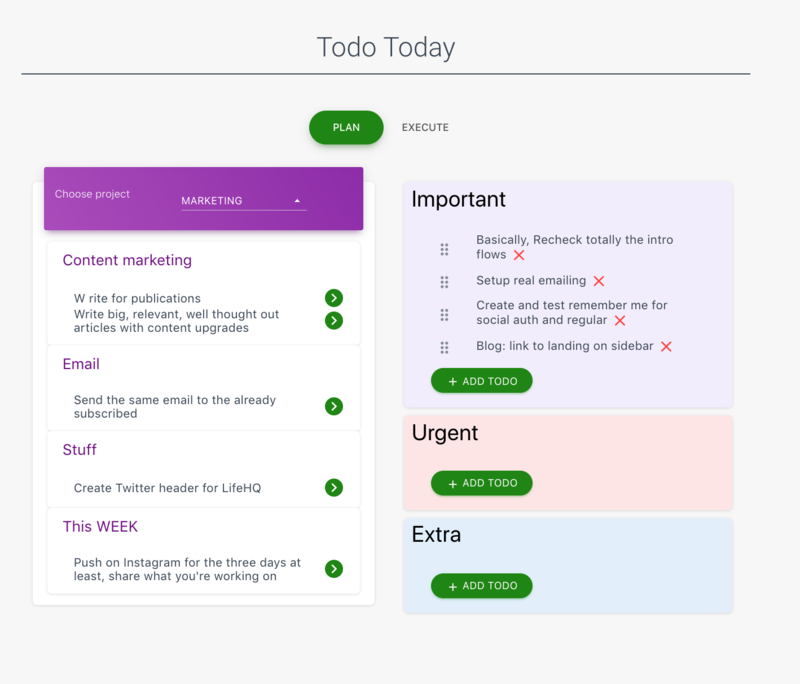 Automatically the software will generate for you daily, weekly, monthly and yearly journal entries so you can always keep track of your long term goals. As a driven individual you are constantly reading books, learning new things, having new experiences and coming up with your own ideas about how your life should be. Traveling often? Create a checklist of all the things you need to pack. Read a book? 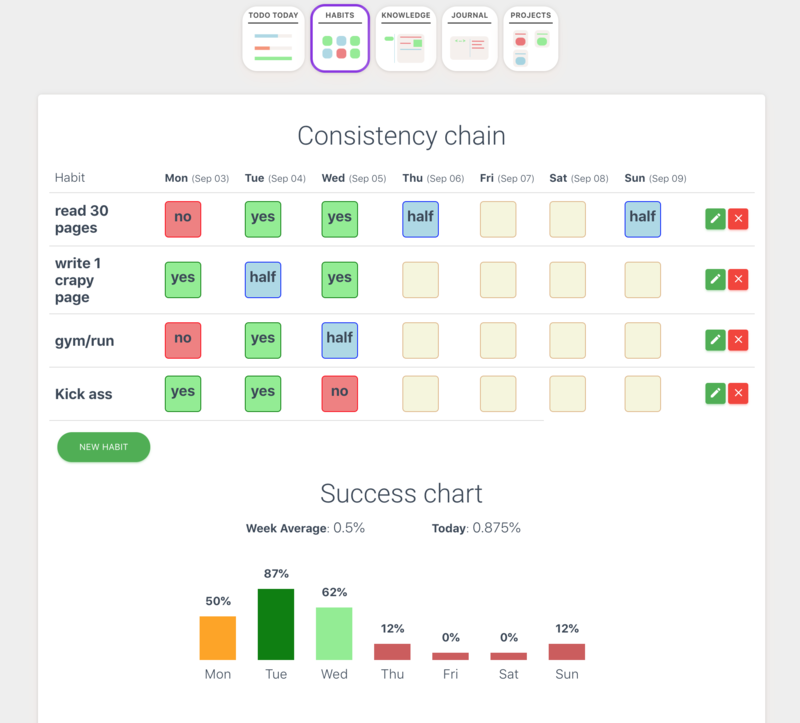 Create a book summary with the most important lessons. Learning new language? Keep a document with all the new words you keep forgetting. Writing a blog? Create a brainstorm document with future ideas for article. Building a company? Record your mistakes and success. That would make a great book. We have identified few of these common documents and will provide you with templates for them to get you started. You also have the ability to create unlimited personal templates in the application. On our landing page you can see LifeHQ in action. Whilst there you can sign up for the upcoming private Beta we will be releasing in October, 2018. The first 1000 subscribers will get the first 6 months for free. Our mission is to make 1 million Millionaires.